Two readings in the past 24hours have come specifically from external marketing (rather than Facebook or word of mouth), namely via my super snazzy new postcard below, placed in the local shop ‘Curious Goods‘ (in the Shambles, Chesterfield). Enormous thanks to the shop and the staff (thank you Lelani!) for promoting my services. Both satisfied customers, word of mouth referrals promised. Attended the fourth of a series of four Business Link Workshops on Monday entitled ‘how to run a successful business’. Interestingly – having taken the course for the E-Secretaries business I’m staring up at the moment – I picked up both a Tarot client and a Life Coaching one! Fascinating life this is. 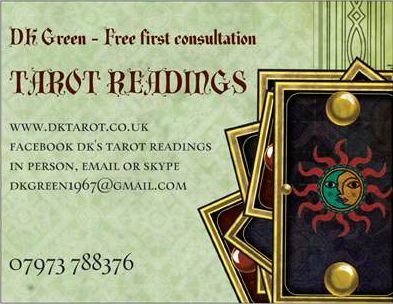 Ooh and please don’t forget to ‘Like’ our Facebook Page for a 10% discount on all readings purchased via the ‘shop’ integrated into the left hand menu of the page… and add us on Twitter now too!